Jim Russell (Purdue University, 1975) executive vice president of Delta Tau Delta since 2001, has been elected to serve as president of the Fraternity Executives Association (FEA). Founded in 1930, the FEA provides for the professional development of its members while promoting the values and success of the fraternal movement. More than 80 member organizations are represented in FEA by their executive directors. They lead their respective fraternity/sorority professional staffs who also participate in FEA programming and support. The board of directors is selected by the executive directors. Russell’s term began on June 2 during the FEA annual meeting in Kansas City, Mo. He leads the six-person 2016-17 board including Krystal Slivinski, Alpha Sigma Alpha, President-Elect; Justin Buck, Pi Kappa Alpha, Secretary-Treasurer; Linda Ablard, Alpha Delta Pi, Director; Juli Willeman, Pi Beta Phi, Director; Wynn Smiley, Alpha Tau Omega, Past President. When he was first elected to the board in 2013 he became the first Delt to hold an FEA board position since the late Al Sheriff (Washington & Jefferson College, 1949) in 1975-1976. Sheriff was executive vice president of Delta Tau Delta from 1965 to 1981 and is the only other Delt to serve as FEA president. Russell previously served the Fraternity as a chapter advisor, house corporation president and treasurer, Indianapolis Alumni Chapter president and as Northern Division president. In addition to his Delt service, Russell has held several interfraternal positions, including serving on the membership committee of the North-American Interfraternity Conference from 2006-2009 and as a board member of the Fraternal Information and Programming Group (FIPG). 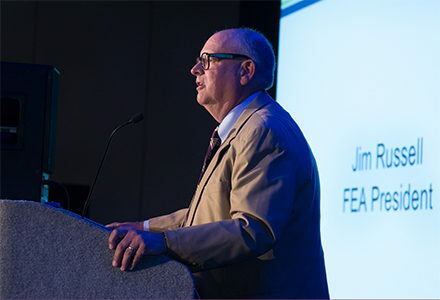 Within FEA he has served as chairman of the annual membership survey since 2002, as program chair of the 2011 annual meeting and on the nominations committee.